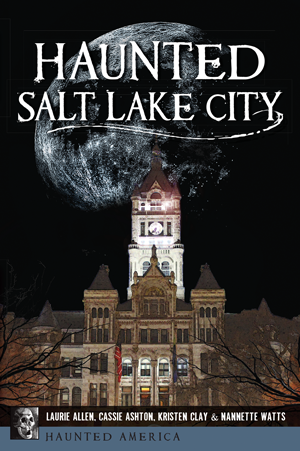 Uncovering ghost stories in Salt Lake City leads to a spooky mixture of legend, lore and local history. A young female apparition likes to surprise guests of the McCune Mansion by leaping from a mirror. Believed to be stationed at Fort Douglas, a Civil War vet named Clem still teases female visitors. Staff at the historic Devereaux Mansion, once a major social center, relented in their vain nightly attempts to keep the lights off and let the spirits continue their eternal party. And nuns of the Sisters of the Holy Cross still visit patients in the hospital they established. The guides of Story Tours' Salt Lake City Ghost Tour reveal characters who just can't seem to leave the valley. Storyteller Kristen Clay is the creator and director of Story Tours: Ogden and Salt Lake City Ghost Tours and Hysterical History Tours. Laurie Allen manages Ogden Story Tours and has been with Ogden and SLC Tours since its inception; she also tells American history stories. Cassie Howard-Ashton told stories with SLC Tours for more than ten years. She is a relationship coach and committee chair for the Timpanogos Storytelling Festival. Nannette Watts manages SLC Story Tours. She is the author of Youth Tell and a director of National Youth Storytelling with Timpanogos Storytelling.